When you hike out of the woods and there are no longer rooted trees and plants, it is because you are on ground that can not support life - either sand or rock. And, since sand is just rock that has been pulverized, its all rock and hiking on it safely requires special concerns to keep in mind. If you've ever walked on the beach, you've felt the sand give way with every step you take. When you walk on wet sand that is packed, the going is much easier than on dry, soft sand. 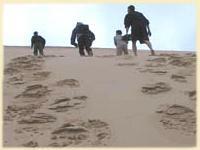 When the sand is piled and you are hiking up or across it, every step sinks or slips back making the going slow and more dangerous. Risks of stumbling, twisting your ankle, or causing a sandslide increase as the slope gets steeper and you get more tired. So, go slow, carefully place each step, and look for more stable ground. Scree is bits of broken rock piled up at the base of a cliff. In the mountains, daily heating and freezing of moisture on the solid rock causes it to slowly break the rock apart and tumble down. A scree slope will pile up to its steepest possible angle. Depending on the size and shape of the rock chunks, that angle may be shallow or steep. Any additional rock that falls on the slope will roll down until it finds a resting place or hits the bottom. The same is true for your foot! When you step onto a slope of loose rock, just like sand, it will give way under the weight until the material under it settles with the new weight. This may be 1/32 of an inch or it may be a few inches. In some cases, you may be sliding down the slope along with a couple tons of rock, all looking for stable places to rest. Established trails across scree tend to be packed indentations where many people have helped push the rock down a bit until there is a slightly wider path across the face of the slope. 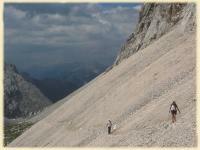 Scree trails can't have very steep inclines so they typically run straight across or a slight rise. It is very important to remain on the trail and watch your step. I'm not kidding when I say that you can find yourself 100 yards downhill with 1 to 5 pound rocks bouncing all around you from just one mis-step. Screeing is a fun, very dangerous tactic of quickly descending a scree slope. If the scree is small enough and deep enough, you can kind of ski down it in your boots. You are actually creating a mini-rockslide and riding it down. Make sure there are no larger rocks to trip you up and no one below you. And, there's a good chance you will take a tumble, so doing it only on grape or orange sized scree rather than cantelope and watermelon sized scree is a good idea. Talus is really what scree is. People just tend to call smaller bits of rock Scree and bigger stuff Talus. Really big Talus is called Boulders. It's all the stuff that has broken off of mountains and piled up. Depending on the composition of the original rock, the pieces of talus will be tiny, huge, or somewhere in between. After practice and you are sure of your strength, balance, and ability, you can practically dance down a boulder field. Know where you are landing and have the next couple of steps already planned ahead. I usually hop back and forth when descending a steeper field because the change in direction helps slow me down - its kind of like turning on skis to slow down. It's easy to miss a step. Twisted ankles, scraped shins, broken bones are all things to consider. If you are going to boulder hop, think ahead about how you will get out with a broken leg. If you don't think you can, then you should find a different trail or go slowly and carefully. Don't even try rock hopping if it is raining, or your boots are wet, or its cold enough for ice. Any slippery surface will be disastrous. It will take a long, long time to cover a mile. 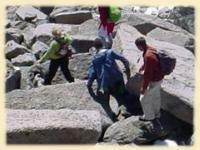 Reduce your distance expectations if part of your trail is on loose scree or talus. Chances of slips and failing rock are greater on the descent than the ascent. You are hitting with much more force coming downhill. Don't hike up a slope at a steep angle. Go across in a switchback style. This gives the rock a better chance to accept your extra weight and keeps the person behind you out of your 'rock schadow' - that danger area where you will kick loose rocks. If you kick loose some rocks, yell "Rock!". If you hear someone above you yell "Rock! ", crouch down and cover your head. It's not cool to yell "Rock!" as a joke - kind of like yelling "Fire!" in a theatre. Stay completely focused on where you are putting your feet. Checking out the scenery should only be done when you stop to rest. Use hiking poles for more support on loose rock. If yours have metal tips, they may be more dangerous if you are stepping from rock to rock. I don't know how many times I would have left grey matter on the mountain if I hadn't been wearing a climbing helmet. My rule of thumb is that I don't wear a helmet on hikes, but I do if it's a "scramble" up a mountain on which the slope angle is steep and people are using dislodging rock with their feet and hands. I recommend reading the book, The Last Season, by Eric Blehm. It's the true story of a Sierra backcountry ranger that goes missing. But there's another story in the book about a couple of young guys who were out peakbagging in the Sierras. If I recall, they had finished one peak and one of them wanted to try another nearby peak; he took the lead, then took a step on some talus. That in turn started a rock slide, taking him with it. His friend was behind him and managed to avoid the slide. He thought surely his friend died, but then saw him stand momentarily, then collapsed. If I recall, both legs were broken and he had a ruptured spleen etc. His friend was able to make his way down, but after seeing him, he knew he'd have to run for help. Unfortunately, the guy died, probably soon after his friend left him. So yes, be careful on scree, talus; it can look solid but it can fool you. Ronnette - thanks for the pointer. I'll check the library. Gene Babcock: that is a wild story. Glad you're alive to spread that story. I encounter both talus and scree regularly in Californian mountains. I usually avoid it. In many areas the talus is sort of fist-sized. I cannot make even two feet on this substrate without causing a little avalanche and sliding to the bottom. Some of our coastal trails are so worn away on both sides that you end up with a sort of narrow, pointed peak that you must walk along. Many of our trails are partly sandy as well, so they give way very easily. I've learned to be suspicious of any sloped trail portion that would take a few steps to traverse.